The molecular formula is C12H21NHCl and the molecular weight is 215.76. Memantine HCl occurs as a fine white to off-white powder and is soluble in water. Namenda is available as tablets or as an oral solution. Namenda is available for oral administration as capsule-shaped, film-coated tablets containing 5 mg and 10 mg of memantine hydrochloride. The tablets also contain the following inactive ingredients: microcrystalline cellulose/colloidal silicon dioxide, talc, croscarmellose sodium, and magnesium stearate. In addition the following inactive ingredients are also present as components of the film coat: hypromellose, titanium dioxide, polyethylene glycol 400, FD&C yellow #6 and FD&C blue #2 (5 mg tablets), and hypromellose, titanium dioxide, macrogol/polyethylene glycol 400 and iron oxide black (10 mg tablets). Namenda oral solution contains memantine hydrochloride in a strength equivalent to 2 mg of memantine hydrochloride in each mL. The oral solution also contains the following inactive ingredients: sorbitol solution (70%), methyl paraben, propylparaben, propylene glycol, glycerin, natural peppermint flavor #104, citric acid, sodium citrate, and purified water. Memantine is well absorbed after oral administration and has linear pharmacokinetics over the therapeutic dose range. It is excreted predominantly in the urine, unchanged, and has a terminal elimination half life of about 60-80 hours. Following oral administration memantine is highly absorbed with peak concentrations reached in about 3-7 hours. Food has no effect on the absorption of memantine. The mean volume of distribution of memantine is 9-11 L/kg and the plasma protein binding is low (45%). Memantine undergoes partial hepatic metabolism. About 48% of administered drug is excreted unchanged in urine; the remainder is converted primarily to three polar metabolites which possess minimal NMDA receptor antagonistic activity: the N-glucuronide conjugate, 6-hydroxy memantine, and 1-nitroso-deaminated memantine. A total of 74% of the administered dose is excreted as the sum of the parent drug and the N-glucuronide conjugate. The hepatic microsomal CYP450 enzyme system does not play a significant role in the metabolism of memantine. Memantine has a terminal elimination half-life of about 60-80 hours. Renal clearance involves active tubular secretion moderated by pH dependent tubular reabsorption. Renal Impairment: Memantine pharmacokinetics were evaluated following single oral administration of 20 mg memantine HCl in 8 subjects with mild renal impairment (creatinine clearance, CLcr, >50 â€“ 80 mL/min), 8 subjects with moderate renal impairment (CLcr 30 â€“ 49 mL/min), 7 subjects with severe renal impairment (CLcr 5 â€“ 29 mL/min) and 8 healthy subjects (CLcr > 80 mL/min) matched as closely as possible by age, weight and gender to the subjects with renal impairment. Mean AUC0-âˆž increased by 4%, 60%, and 115% in subjects with mild, moderate, and severe renal impairment, respectively, compared to healthy subjects. The terminal elimination half-life increased by 18%, 41%, and 95% in subjects with mild, moderate, and severe renal impairment, respectively, compared to healthy subjects. No dosage adjustment is recommended for patients with mild and moderate renal impairment. Dosage should be reduced in patients with severe renal impairment (See DOSAGE AND ADMINISTRATION). Hepatic Impairment: Memantine pharmacokinetics were evaluated following the administration of single oral doses of 20 mg in 8 subjects with moderate hepatic impairment (Child-Pugh Class B, score 7-9) and 8 subjects who were age-, gender-, and weight-matched to the hepatically-impaired subjects. There was no change in memantine exposure (based on Cmax and AUC) in subjects with moderate hepatic impairment as compared with healthy subjects. However, terminal elimination half-life increased by about 16% in subjects with moderate hepatic impairment as compared with healthy subjects. No dose adjustment is recommended for patients with mild and moderate hepatic impairment. Memantine should be administered with caution to patients with severe hepatic impairment as the pharmacokinetics of memantine have not been evaluated in that population. Elderly: The pharmacokinetics of Namenda in young and elderly subjects are similar. Gender: Following multiple dose administration of Namenda 20 mg b.i.d., females had about 45% higher exposure than males, but there was no difference in exposure when body weight was taken into account. Substrates of Microsomal Enzymes: In vitro studies indicated that at concentrations exceeding those associated with efficacy, memantine does not induce the cytochrome P450 isozymes CYP1A2, CYP2C9, CYP2E1 and CYP3A4/5. In addition, in vitro studies have shown that memantine produces minimal inhibition of CYP450 enzymes CYP1A2, CYP2A6, CYP2C9, CYP2D6, CYP2E1, and CYP3A4. These data indicate that no pharmacokinetic interactions with drugs metabolized by these enzymes are expected. Inhibitors of Microsomal Enzymes: Since memantine undergoes minimal metabolism, with the majority of the dose excreted unchanged in urine, an interaction between memantine and drugs that are inhibitors of CYP450 enzymes is unlikely. Coadministration of Namenda with the AChE inhibitor donepezil HCl does not affect the pharmacokinetics of either compound. Drugs Eliminated via Renal Mechanisms: Memantine is eliminated in part by tubular secretion. In vivo studies have shown that multiple doses of the diuretic hydrochlorothiazide/triamterene (HCTZ/TA) did not affect the AUC of memantine at steady state. Memantine did not affect the bioavailability of TA, and decreased AUC and Cmax of HCTZ by about 20%. Coadministration of memantine with the antihyperglycemic drug Glucovance® (glyburide and metformin HCl) did not affect the pharmacokinetics of memantine, metformin and glyburide. Memantine did not modify the serum glucose lowering effects of Glucovance®, indicating the absence of a pharmacodynamic interaction. Drugs that make the urine alkaline: The clearance of memantine was reduced by about 80% under alkaline urine conditions at pH 8. Therefore, alterations of urine pH towards the alkaline state may lead to an accumulation of the drug with a possible increase in adverse effects. Drugs that alkalinize the urine (e.g. carbonic anhydrase inhibitors, sodium bicarbonate) would be expected to reduce renal elimination of memantine. Drugs highly bound to plasma proteins: Because the plasma protein binding of memantine is low (45%), an interaction with drugs that are highly bound to plasma proteins, such as warfarin and digoxin, is unlikely. The effectiveness of Namenda (memantine hydrochloride) as a treatment for patients with moderate to severe Alzheimer's disease was demonstrated in 2 randomized, double-blind, placebo-controlled clinical studies (Studies 1 and 2) conducted in the United States that assessed both cognitive function and day to day function. The mean age of patients participating in these two trials was 76 with a range of 50-93 years. Approximately 66% of patients were female and 91% of patients were Caucasian. A third study (Study 3), carried out in Latvia, enrolled patients with severe dementia, but did not assess cognitive function as a planned endpoint. Study Outcome Measures: In each U.S. study, the effectiveness of Namenda was determined using both an instrument designed to evaluate overall function through caregiver-related assessment, and an instrument that measures cognition. 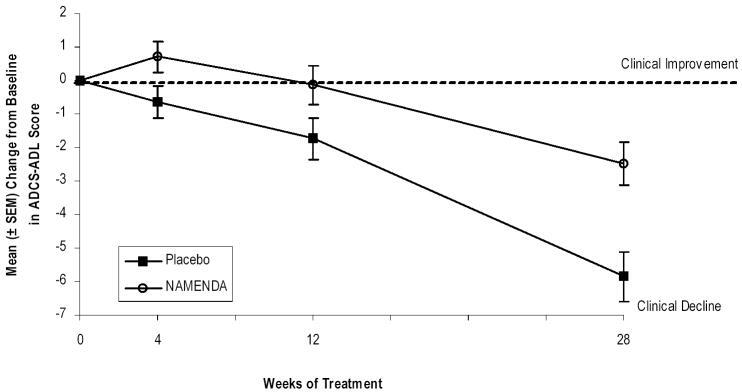 Both studies showed that patients on Namenda experienced significant improvement on both measures compared to placebo. In a study of 28 weeks duration, 252 patients with moderate to severe probable Alzheimer's disease (diagnosed by DSM-IV and NINCDS-ADRDA criteria, with Mini-Mental State Examination scores â‰¥3 and â‰¤14 and Global Deterioration Scale Stages 5-6) were randomized to Namenda or placebo. For patients randomized to Namenda, treatment was initiated at 5 mg once daily and increased weekly by 5 mg/day in divided doses to a dose of 20 mg/day (10 mg twice a day). 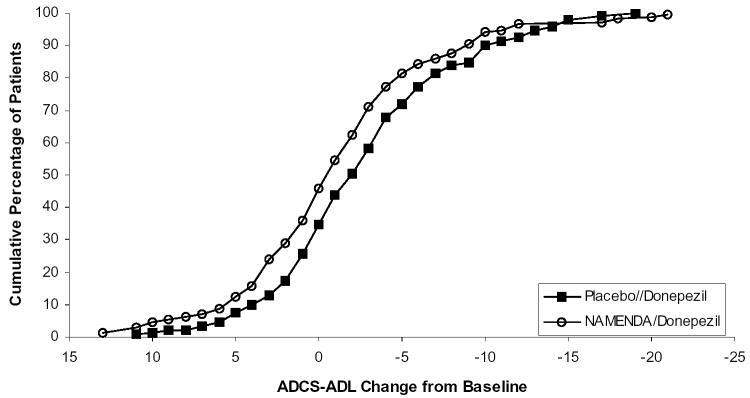 Figure 1 shows the time course for the change from baseline in the ADCS-ADL score for patients in the two treatment groups completing the 28 weeks of the study. At 28 weeks of treatment, the mean difference in the ADCS-ADL change scores for the Namenda -treated patients compared to the patients on placebo was 3.4 units. Using an analysis based on all patients and carrying their last study observation forward (LOCF analysis), Namenda treatment was statistically significantly superior to placebo. 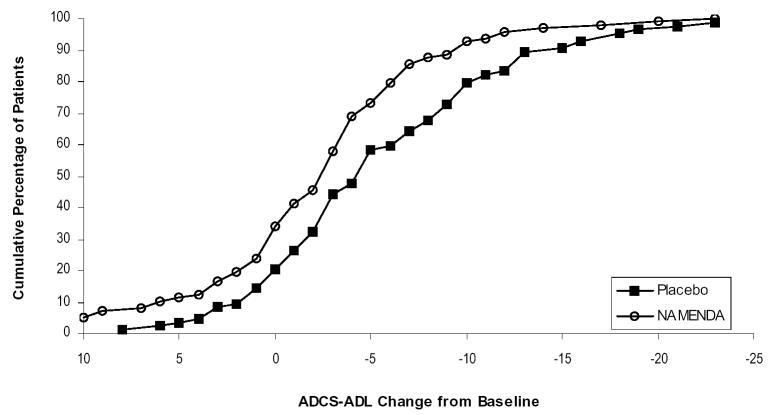 Figure 2 shows the cumulative percentages of patients from each of the treatment groups who had attained at least the change in the ADCS-ADL shown on the X axis. 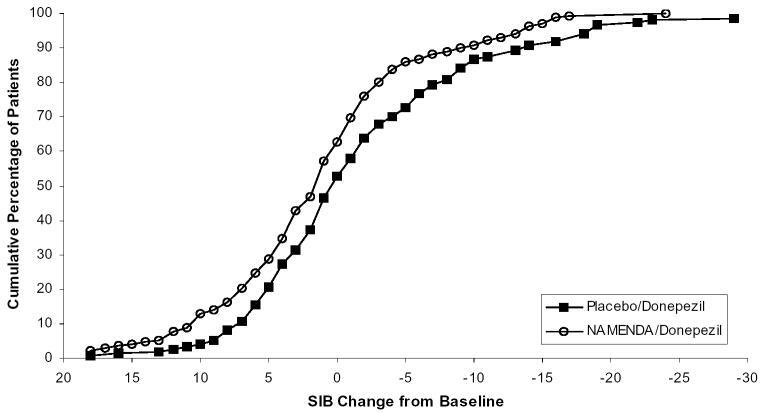 Figure 4 shows the cumulative percentages of patients from each treatment group who had attained at least the measure of change in SIB score shown on the X axis. The curves show that both patients assigned to Namenda and placebo have a wide range of responses and generally show deterioration, but that the Namenda group is more likely to show a smaller decline or an improvement. 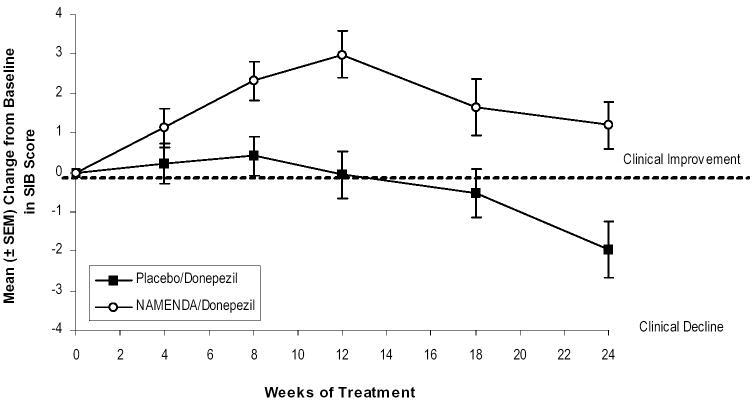 In a study of 24 weeks duration, 404 patients with moderate to severe probable Alzheimer's disease (diagnosed by NINCDS-ADRDA criteria, with Mini-Mental State Examination scores â‰¥5 and â‰¤14) who had been treated with donepezil for at least 6 months and who had been on a stable dose of donepezil for the last 3 months were randomized to Namenda or placebo while still receiving donepezil. 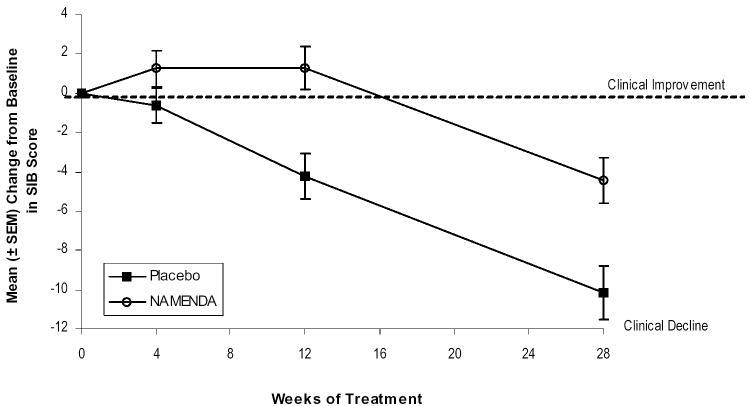 For patients randomized to Namenda, treatment was initiated at 5 mg once daily and increased weekly by 5 mg/day in divided doses to a dose of 20 mg/day (10 mg twice a day). Figure 6 shows the cumulative percentages of patients from each of the treatment groups who had attained at least the measure of improvement in the ADCS-ADL shown on the X axis. The curves show that both patients assigned to Namenda/donepezil and placebo/donepezil have a wide range of responses and generally show deterioration, but that the Namenda/donepezil group is more likely to show a smaller decline or an improvement. 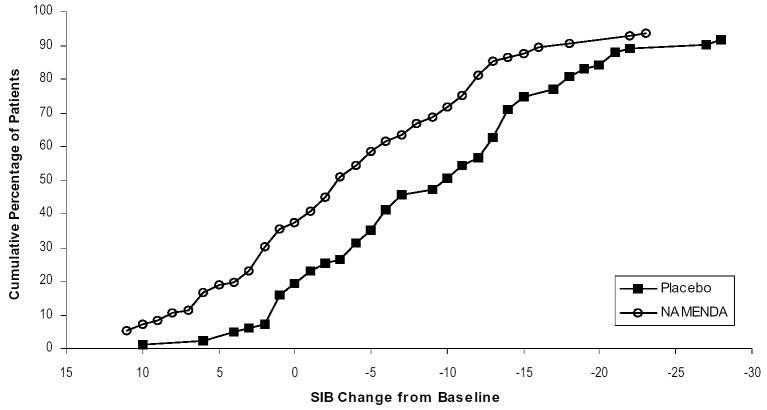 Figure 8 shows the cumulative percentages of patients from each treatment group who had attained at least the measure of improvement in SIB score shown on the X axis. 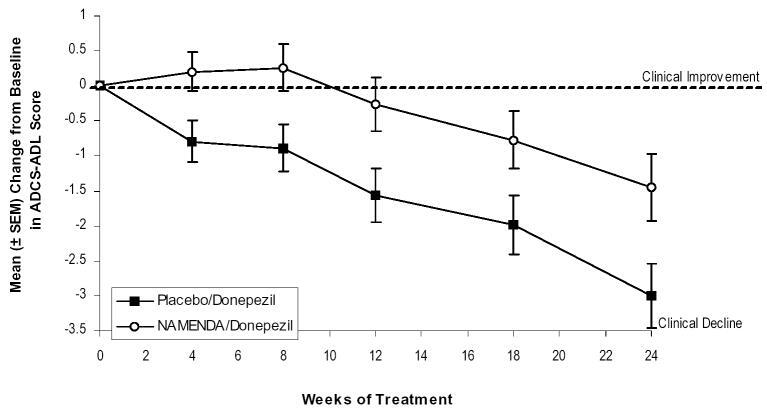 The curves show that both patients assigned to Namenda/donepezil and placebo/donepezil have a wide range of responses, but that the Namenda/donepezil group is more likely to show an improvement or a smaller decline. In a double-blind study of 12 weeks duration, conducted in nursing homes in Latvia, 166 patients with dementia according to DSM-III-R, a Mini-Mental State Examination score of less than 10, and Global Deterioration Scale staging of 5 to 7 were randomized to either Namenda or placebo. For patients randomized to Namenda, treatment was initiated at 5 mg once daily and increased to 10 mg once daily after 1 week. The primary efficacy measures were the care dependency subscale of the Behavioral Rating Scale for Geriatric Patients (BGP), a measure of day-to-day function, and a Clinical Global Impression of Change (CGI-C), a measure of overall clinical effect. No valid measure of cognitive function was used in this study. A statistically significant treatment difference at 12 weeks that favored Namenda over placebo was seen on both primary efficacy measures. 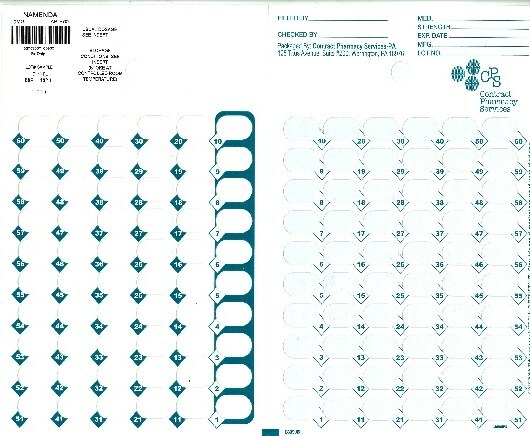 Because the patients entered were a mixture of Alzheimer's disease and vascular dementia, an attempt was made to distinguish the two groups and all patients were later designated as having either vascular dementia or Alzheimer's disease, based on their scores on the Hachinski Ischemic Scale at study entry. Only about 50% of the patients had computerized tomography of the brain. For the subset designated as having Alzheimer's disease, a statistically significant treatment effect favoring Namenda over placebo at 12 weeks was seen on both the BGP and CGI-C.
Namenda (memantine hydrochloride) is indicated for the treatment of moderate to severe dementia of the Alzheimer's type. Seizures: Namenda has not been systematically evaluated in patients with a seizure disorder. In clinical trials of Namenda, seizures occurred in 0.2% of patients treated with Namenda and 0.5% of patients treated with placebo. Conditions that raise urine pH may decrease the urinary elimination of memantine resulting in increased plasma levels of memantine. Namenda undergoes partial hepatic metabolism, with about 48% of administered dose excreted in urine as unchanged drug or as the sum of parent drug and the N-glucuronide conjugate (74%). No dosage adjustment is needed in patients with mild or moderate hepatic impairment. Namenda should be administered with caution to patients with severe hepatic impairment. No dosage adjustment is needed in patients with mild or moderate renal impairment. A dosage reduction is recommended in patients with severe renal impairment (see CLINICAL PHARMACOLOGY and DOSAGE AND ADMINISTRATION). N-methyl-D-aspartate (NMDA) antagonists: The combined use of Namenda with other NMDA antagonists (amantadine, ketamine, and dextromethorphan) has not been systematically evaluated and such use should be approached with caution. Effects of Namenda on substrates of microsomal enzymes: In vitro studies conducted with marker substrates of CYP450 enzymes (CYP1A2, -2A6, -2C9, -2D6, -2E1, -3A4) showed minimal inhibition of these enzymes by memantine. In addition, in vitro studies indicate that at concentrations exceeding those associated with efficacy, memantine does not induce the cytochrome P450 isozymes CYP1A2, CYP2C9, CYP2E1 and CYP3A4/5. No pharmacokinetic interactions with drugs metabolized by these enzymes are expected. Effects of inhibitors and/or substrates of microsomal enzymes on Namenda: Memantine is predominantly renally eliminated, and drugs that are substrates and/or inhibitors of the CYP450 system are not expected to alter the metabolism of memantine. Acetylcholinesterase (AChE) inhibitors: Coadministration of Namenda with the AChE inhibitor donepezil HCl did not affect the pharmacokinetics of either compound. In a 24-week controlled clinical study in patients with moderate to severe Alzheimer's disease, the adverse event profile observed with a combination of memantine and donepezil was similar to that of donepezil alone. Drugs eliminated via renal mechanisms: Because memantine is eliminated in part by tubular secretion, coadministration of drugs that use the same renal cationic system, including hydrochlorothiazide (HCTZ), triamterene (TA), metformin, cimetidine, ranitidine, quinidine, and nicotine, could potentially result in altered plasma levels of both agents. However, coadministration of Namenda and HCTZ/TA did not affect the bioavailability of either memantine or TA, and the bioavailability of HCTZ decreased by 20%. In addition, coadministration of memantine with the antihyperglycemic drug Glucovance® (glyburide and metformin HCl) did not affect the pharmacokinetics of memantine, metformin and glyburide. Furthermore, memantine did not modify the serum glucose lowering effect of Glucovance®. Drugs that make the urine alkaline: The clearance of memantine was reduced by about 80% under alkaline urine conditions at pH 8. Therefore, alterations of urine pH towards the alkaline condition may lead to an accumulation of the drug with a possible increase in adverse effects. Urine pH is altered by diet, drugs (e.g. carbonic anhydrase inhibitors, sodium bicarbonate) and clinical state of the patient (e.g. renal tubular acidosis or severe infections of the urinary tract). Hence, memantine should be used with caution under these conditions. Pregnancy Category B: Memantine given orally to pregnant rats and pregnant rabbits during the period of organogenesis was not teratogenic up to the highest doses tested (18 mg/kg/day in rats and 30 mg/kg/day in rabbits, which are 9 and 30 times, respectively, the maximum recommended human dose [MRHD] on a mg/m2 basis). Slight maternal toxicity, decreased pup weights and an increased incidence of non-ossified cervical vertebrae were seen at an oral dose of 18 mg/kg/day in a study in which rats were given oral memantine beginning pre-mating and continuing through the postpartum period. Slight maternal toxicity and decreased pup weights were also seen at this dose in a study in which rats were treated from day 15 of gestation through the post-partum period. The no-effect dose for these effects was 6 mg/kg, which is 3 times the MRHD on a mg/m2 basis. There are no adequate and well-controlled studies of memantine in pregnant women. Memantine should be used during pregnancy only if the potential benefit justifies the potential risk to the fetus. It is not known whether memantine is excreted in human breast milk. Because many drugs are excreted in human milk, caution should be exercised when memantine is administered to a nursing mother. There are no adequate and well-controlled trials documenting the safety and efficacy of memantine in any illness occurring in children. The experience described in this section derives from studies in patients with Alzheimer's disease and vascular dementia. Adverse Events Leading to Discontinuation: In placebo-controlled trials in which dementia patients received doses of Namenda up to 20 mg/day, the likelihood of discontinuation because of an adverse event was the same in the Namenda group as in the placebo group. No individual adverse event was associated with the discontinuation of treatment in 1% or more of Namenda-treated patients and at a rate greater than placebo. Adverse Events Reported in Controlled Trials: The reported adverse events in Namenda (memantine hydrochloride) trials reflect experience gained under closely monitored conditions in a highly selected patient population. In actual practice or in other clinical trials, these frequency estimates may not apply, as the conditions of use, reporting behavior and the types of patients treated may differ. Table 1 lists treatment-emergent signs and symptoms that were reported in at least 2% of patients in placebo-controlled dementia trials and for which the rate of occurrence was greater for patients treated with Namenda than for those treated with placebo. No adverse event occurred at a frequency of at least 5% and twice the placebo rate. Table 1: Adverse Events Reported in Controlled Clinical Trials in at Least 2% of Patients Receiving Namenda and at a Higher Frequency than Placebo-treated Patients. Other adverse events occurring with an incidence of at least 2% in Namenda-treated patients but at a greater or equal rate on placebo were agitation, fall, inflicted injury, urinary incontinence, diarrhea, bronchitis, insomnia, urinary tract infection, influenza-like symptoms, abnormal gait, depression, upper respiratory tract infection, anxiety, peripheral edema, nausea, anorexia, and arthralgia. The overall profile of adverse events and the incidence rates for individual adverse events in the subpopulation of patients with moderate to severe Alzheimer's disease were not different from the profile and incidence rates described above for the overall dementia population. Vital Sign Changes: Namenda and placebo groups were compared with respect to (1) mean change from baseline in vital signs (pulse, systolic blood pressure, diastolic blood pressure, and weight) and (2) the incidence of patients meeting criteria for potentially clinically significant changes from baseline in these variables. There were no clinically important changes in vital signs in patients treated with Namenda. A comparison of supine and standing vital sign measures for Namenda and placebo in elderly normal subjects indicated that Namenda treatment is not associated with orthostatic changes. Laboratory Changes: Namenda and placebo groups were compared with respect to (1) mean change from baseline in various serum chemistry, hematology, and urinalysis variables and (2) the incidence of patients meeting criteria for potentially clinically significant changes from baseline in these variables. These analyses revealed no clinically important changes in laboratory test parameters associated with Namenda treatment. ECG Changes: Namenda and placebo groups were compared with respect to (1) mean change from baseline in various ECG parameters and (2) the incidence of patients meeting criteria for potentially clinically significant changes from baseline in these variables. These analyses revealed no clinically important changes in ECG parameters associated with Namenda treatment. Namenda has been administered to approximately 1350 patients with dementia, of whom more than 1200 received the maximum recommended dose of 20 mg/day. Patients received Namenda treatment for periods of up to 884 days, with 862 patients receiving at least 24 weeks of treatment and 387 patients receiving 48 weeks or more of treatment. Treatment emergent signs and symptoms that occurred during 8 controlled clinical trials and 4 open-label trials were recorded as adverse events by the clinical investigators using terminology of their own choosing. To provide an overall estimate of the proportion of individuals having similar types of events, the events were grouped into a smaller number of standardized categories using WHO terminology, and event frequencies were calculated across all studies. All adverse events occurring in at least two patients are included, except for those already listed in Table 1, WHO terms too general to be informative, minor symptoms or events unlikely to be drug-caused, e.g., because they are common in the study population. Events are classified by body system and listed using the following definitions: frequent adverse events - those occurring in at least 1/100 patients; infrequent adverse events - those occurring in 1/100 to 1/1000 patients. These adverse events are not necessarily related to Namenda treatment and in most cases were observed at a similar frequency in placebo-treated patients in the controlled studies. Body as a Whole:Frequent: syncope. Infrequent: hypothermia, allergic reaction. Cardiovascular System:Frequent: cardiac failure. Infrequent: angina pectoris, bradycardia, myocardial infarction, thrombophlebitis, atrial fibrillation, hypotension, cardiac arrest, postural hypotension, pulmonary embolism, pulmonary edema. Central and Peripheral Nervous System:Frequent: transient ischemic attack, cerebrovascular accident, vertigo, ataxia, hypokinesia. Infrequent: paresthesia, convulsions, extrapyramidal disorder, hypertonia, tremor, aphasia, hypoesthesia, abnormal coordination, hemiplegia, hyperkinesia, involuntary muscle contractions, stupor, cerebral hemorrhage, neuralgia, ptosis, neuropathy. Gastrointestinal System:Infrequent: gastroenteritis, diverticulitis, gastrointestinal hemorrhage, melena, esophageal ulceration. Hemic and Lymphatic Disorders:Frequent: anemia. Infrequent: leukopenia. Metabolic and Nutritional Disorders:Frequent: increased alkaline phosphatase, decreased weight. Infrequent: dehydration, hyponatremia, aggravated diabetes mellitus. Psychiatric Disorders:Frequent: aggressive reaction. Infrequent: delusion, personality disorder, emotional lability, nervousness, sleep disorder, libido increased, psychosis, amnesia, apathy, paranoid reaction, thinking abnormal, crying abnormal, appetite increased, paroniria, delirium, depersonalization, neurosis, suicide attempt. Respiratory System:Frequent: pneumonia. Infrequent: apnea, asthma, hemoptysis. Skin and Appendages:Frequent: rash. Infrequent: skin ulceration, pruritus, cellulitis, eczema, dermatitis, erythematous rash, alopecia, urticaria. Special Senses:Frequent: cataract, conjunctivitis. Infrequent: macula lutea degeneration, decreased visual acuity, decreased hearing, tinnitus, blepharitis, blurred vision, corneal opacity, glaucoma, conjunctival hemorrhage, eye pain, retinal hemorrhage, xerophthalmia, diplopia, abnormal lacrimation, myopia, retinal detachment. Urinary System:Frequent: frequent micturition. Infrequent: dysuria, hematuria, urinary retention. Although no causal relationship to memantine treatment has been found, the following adverse events have been reported to be temporally associated with memantine treatment and are not described elsewhere in labeling: aspiration pneumonia, asthenia, atrioventricular block, bone fracture, carpal tunnel syndrome, cerebral infarction, chest pain, cholelithiasis, claudication, colitis, deep venous thrombosis, depressed level of consciousness (including loss of consciousness and rare reports of coma), dyskinesia, dysphagia, encephalopathy, gastritis, gastroesophageal reflux, grand mal convulsions, intracranial hemorrhage, hepatitis (including increased ALT and AST and hepatic failure), hyperglycemia, hyperlipidemia, hypoglycemia, ileus, increased INR, impotence, lethargy, malaise, myoclonus, neuroleptic malignant syndrome, acute pancreatitis, Parkinsonism, acute renal failure (including increased creatinine and renal insufficiency), prolonged QT interval, restlessness, sepsis, Stevens-Johnson syndrome, suicidal ideation, sudden death, supraventricular tachycardia, tachycardia, tardive dyskinesia, thrombocytopenia, and hallucinations (both visual and auditory). Memantine induced neuronal lesions (vacuolation and necrosis) in the multipolar and pyramidal cells in cortical layers III and IV of the posterior cingulate and retrosplenial neocortices in rats, similar to those which are known to occur in rodents administered other NMDA receptor antagonists. Lesions were seen after a single dose of memantine. In a study in which rats were given daily oral doses of memantine for 14 days, the no-effect dose for neuronal necrosis was 6 times the maximum recommended human dose on a mg/m2 basis.The potential for induction of central neuronal vacuolation and necrosis by NMDA receptor antagonists in humans is unknown. 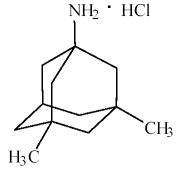 Controlled Substance Class: Memantine HCl is not a controlled substance. Physical and Psychological Dependence: Memantine HCl is a low to moderate affinity uncompetitive NMDA antagonist that did not produce any evidence of drug-seeking behavior or withdrawal symptoms upon discontinuation in 2,504 patients who participated in clinical trials at therapeutic doses. Post marketing data, outside the U.S., retrospectively collected, has provided no evidence of drug abuse or dependence. Signs and symptoms associated with memantine overdosage in clinical trials and from worldwide marketing experience include agitation, confusion, ECG changes, loss of consciousness, psychosis, restlessness, slowed movement, somnolence, stupor, unsteady gait, visual hallucinations, vertigo, vomiting, and weakness. The largest known ingestion of memantine worldwide was 2.0 grams in a patient who took memantine in conjunction with unspecified antidiabetic medications. The patient experienced coma, diplopia, and agitation, but subsequently recovered. The dosage of Namenda (memantine hydrochloride) shown to be effective in controlled clinical trials is 20 mg/day. The recommended starting dose of Namenda is 5 mg once daily. The recommended target dose is 20 mg/day. The dose should be increased in 5 mg increments to 10 mg/day (5 mg twice a day), 15 mg/day (5 mg and 10 mg as separate doses), and 20 mg/day (10 mg twice a day). The minimum recommended interval between dose increases is one week. The capsule-shaped, film-coated tablets are gray, with the strength (10) debossed on one side and FL on the other.